An entertaining, accessible, and occasionally annoying observation of art. I didn’t take any art history or art appreciation classes in college. Actually, I didn’t even go to college, but if I had, I imagine I might’ve enjoyed that kind of thing. Luckily, the DVD release of documentaries such as Understanding Art: Impressionism ensures that I’ll never have to regret my lack of education. Completely accessible and incredibly in-depth, this four-part program was a lot more interesting and entertaining than sitting in a classroom taking notes. Even better, this review is the only homework I’ll have to do. These days, the work of Impressionists can be found everywhere. Postcards, t-shirts, and coffee mugs feature the works of Claude Monet, Pierre-Auguste Renoir, Jean-Frédéric Bazille, and Camille Pissarro, but it was not always so. Back in the proverbial day, when these fine artists were perfecting their craft, they were nothing short of revolutionary, as this documentary illustrates. Bucking the traditional (i.e. - bland and academic) French salon system, the Impressionists emphasized changing qualities of light, common subject matter, and other elements of human perception in their work. In four episodes, Understanding Art: Impressionism details not only the work of each individual artist, but also the advancements in technology that they utilized in order to craft their masterpieces. The advent of the paint tube, along with smaller, portable canvasses, and advancements in brush shapes opened a new world of opportunity and artistic freedom that was wholeheartedly accepted by these geniuses. As the old saying goes, I don’t know much about art, but I know what I like. And what I liked about this series was not only the insane amount of attention given to the artists and the changing world around them, but of course, the attention given to the art itself. I had always assumed the real reason for getting an HD television was to play video games and watch Star Wars. Turns out it’s really cool to take a close-up look at a piece of art, surveying the landscape of individual brushstrokes and experiencing the work in a way that would be impossible to do unless you were actually holding it in your hands. And being a lover of pop art, I found it interesting to draw parallels between the revolutionary style of the Impressionists in the 19th century and the ground breaking sequential artwork of gentlemen like Jack Kirby or Steve Ditko in the 20th century. No, that’s not in the movie. I just really like comics. But the comparison is valid, as guys like Kirby emphasized fluidity, motion, and capturing a mood just as the Impressionists did. Yes, I’m attempting to turn a review into my own dissertation on modern art. But to bring the whole thing full circle, my comparisons between artistic revolutionaries underscores just how accessible this documentary was. While the discussion is about fine art, it is not pretentious in the least and doesn’t require a degree to be enjoyed. As accessible as it may be, there is another old saying that sprung to mind while watching this documentary series: “Those who can, do and those who can’t, teach.” But in reference to the program’s host, celebrated art critic Waldemar Januszczak, perhaps that old saying should be amended to read “… those who can’t do whatever they can do put themselves in the spotlight and hog all the attention and glory from the subject.” Or to put it more simply, the guy who hosts the show is as annoying as the day is long. The man was twice honored as Critic of the Year by the Press Association of the United Kingdom and Ireland, which is no doubt a grand distinction, but apparently Januszczak felt that such an honor puts one in league with Billy Crystal, Robin Williams, and Whoopi Goldberg. Unfortunately, grandstanding and spouting tired, corny jokes isn’t really something one looks for when watching a show about fine art. The series was easy to understand and ready-made for the common man, but Januszazck made it almost unwatchable. Remember that time, just a few short paragraphs ago, when I left you scratching your head, wondering why I was hijacking a review of a documentary on Impressionism to talk about comic books? Now imagine me doing a soft-shoe routine dressed as a clown and you’ve got a pretty good idea of how Januszazck attempts to hijack this program. While it in no way ruins the show, it definitely diminishes its re-watchability. In addition to the four-episode Impressionism series, this three-disc set also includes two additional documentaries. Vincent: the Full Story and Manet: the Man Who Invented Modern Art are both as entertaining and educational as the main series. There’s also a 17-page booklet included which covers much of the same ground as the series and serves as a handy reference book. At the end of the day, not even the most concerted efforts of Waldemar Januszazck to steal the spotlight from the actual stars of this program could diminish its quality. 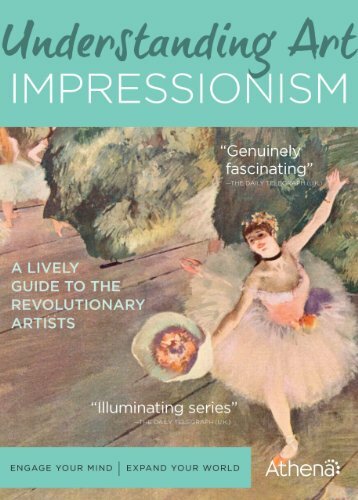 Understanding Art: Impressionism presented an enjoyable and detailed look at an important artistic movement, the repercussions of which are still being felt today. It’s definitely worth your time.